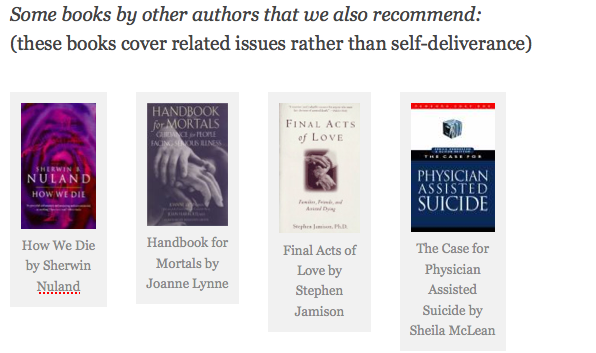 Five Last Acts, published three years ago, broke new ground with methods of self-deliverance and clear explanations of the popular methods of suicide for the self-delivering individual. Now Five Last Acts, 2nd edition, completely revised & updated, is expanded from 186 pages to over 400. And a change of publishers means it will be available world-wide. Original chapters have been greatly expanded to make things even simpler. New evidence is included for the first time. More diagrams help you to understand the stages. It now include suppliers, and reviews of 3rd party products and aids not covered elsewhere. Contrary claims are examined and laid to rest. Five Last Acts, 2nd edition is probably the most extensive manual on self-deliverance yet published. Lavishly illustrated with clear step-by-step diagrams and fully referenced with hundreds of citations from the scientific literature. Plus an authoritative guide to the ins and outs of staying within the law and legal risk-taking from the UK. Methods & approaches compared. Safeguards. Dealing with relatives and health care providers. Everything you need to put your mind at ease and give you the confidence to face an unknown future. Five Last Acts, 2nd edition will be available at a reduced price to most Exit members. Exit has been publishing self-deliverance information since 1980 – longer than anyone in the world. The information is thorough and scientific. Most of it can not be obtained from any other source. Arguments over the ‘best’ method are thoroughly examined, as are the claims of various pieces of literature or ‘right-to-die’ organisations. Five Last Acts, 2nd edition, deals with a difficult subject. It does not encourage suicide. For many, just knowing they will be in control gives them the peace of mind they seek. But for the small minority whose suffering is unbearable and unrelievable, it shows how to choose the time of one’s dying with the minimum of pain or hurt – to oneself and others. Update 5th October – 2nd edition is now at the printers – look out for it on Amazon.com within a few weeks. regular bookshops to follow. Large discount available to members. Update 13th October – 2nd edition now available. Purchase here. This entry was posted in self deliverance and tagged compression, Dignitas, drugs, Five Last Acts, helium, legislation, starvation. Bookmark the permalink. So sad the Bill was not passed today but can see some reasons why. I wish to know if I become terminally ill whatyoptions are. Thank you. We never held out that much hope for it (they never ask our advice unfortunately until they have already drafted something). Your options, should you become terminally ill, are a) go to Dignitas in Switzerland (considerable joining process and usually high costs); b) self-euthanasia (for which see our books); c) refusal of treatment (living will) but *only* if your terminal process will be hastened by non-treatment; d) stick it out, and make a lot of noise to get the best palliative care available.